There are so few pure moments in ordained ministry. Most of what we do is organised with an end in sight, with an intended emotion, with intended actions and with an outcome that is hopefully beneficial both to career and parishioner. In contrast, the pure moments sneak in like the person who slips into church after they know everyone else has taken a seat. Preachers know what I mean. That sermon you slave away on all week gets a “meh” response. The one you wrote in desperation that morning and tweaked while you delivered it? The one that makes you want to say to each person shaking your hand at the end of the service: “sorry about that” is the one that makes them clasp your hand, make deep eye contact and say, “Thank You.”. Priests know what I mean. The big middle class baptism where the people are charming and you feel a bit “connected” goes flat by the end because like the caterer your job is done and they have already moved on to the next agenda item. The packed, rowdy estate baptism where the congregation laugh, keep the right amount of respect and are genuinely grateful that you’d let them be part of something so beautiful and fun makes you feel like you have moved a little something forward in the cosmos even if you never see them in church again. I was moved to write this because I’ve just come from the bedside of a dying man where I have experienced one of those pure moments. He’s someone I am fond of and someone who has always been supportive of my ministry even when it was kind of hard to do so. I got a phone call asking if I could come to the care home and say some prayers. So I dropped everything and drove over. He was struggling and he isn’t going to be with us much longer. The pure moment came when I prayed for him, made the sign of the cross on his forehead and gave him permission to let go, to be at peace and to be assured of God’s love for him now and always. A little something broke free in the room. I don’t know how to describe it except as a sort of peace and rightness. A man lies dying with family nearby stroking his hand and speaking gently to him. He receives blessing and an assurance that his life mattered and will matter. With his lungs filled with final breaths, his ears hear that he is loved and that he will be missed. He hears that he is a part of all of us as friend, father, father-in-law, husband, granddad. I want to weep but I can’t because I feel at peace. It was a moment that could not be manufactured. Deathbed scenes are often more grim vigils than peaceful passings. Death can occupy the room so oppressively that love and good remembering get chased away. Sometimes when you speak ancient words and sentiments and address a life lived in real faith something gets unlocked. When you affirm a life lived the best he knew how as you touch his forehead and hold his wife’s hand something genuinely good for the world is released. We are meant to continually tell the story of hope and peace and love until we can speak no more because that is the sustaining story of life. This is what we were created to do as we journey together from cradle to grave. Keep a look out for those pure moments and expect them in the least likely places because that is where they burn the brightest. You may only catch them for a moment or see them in the corner of your eye. That’s okay. As long as you find them and allow yourself to be refreshed and nourished by them for your long journey of life. This entry was posted in Uncategorized and tagged deathbed, mystery, peace on October 29, 2013 by newnortherner. When you read articles like this it can leave you scratching your head. I can understand some people not believing that the climate is changing for the worse. I can accept that some people might think it is changing but that we are a bit hasty to assume it is mainly a human created problem. But what I’ve never understood in some evangelical circles is the adherence to this denial as if it were handed down on Sinai. Maybe there is a mistrust of anything that sounds “green” because it must be driven by a liberal agenda. Maybe it is that mistaken infusion of the gospel with productivity, prosperity and the idea that God gave us dominion over the Earth rather than stewardship of it. Maybe it comes from the idea that God is going to trash it all in the end. I’m going to take a punt here and say that climate change is denied not so much for being untrue but rather because the truth we don’t want to accept is that we messed up and we really can’t fix it. Like children we look at the mess and when asked how it happened, we say “I don’t know”. In Genesis, Adam and Eve get full run of the garden and cavort and eat and play and tend to nature and name animals. It is implied that at the end of the day they hang out with God. It’s an attractive scene. And then they eat the fruit; they do the one thing they were asked not to do and suddenly there is shame and hiding and fig leaves. No one told them that being naked was shameful. But now, after eating the fruit, suddenly they see things in a different way and they generate their own shame at being naked. They hide from God but when found, they don’t say, “hey we messed up”. They get stressed and try to explain the fig leaves and then point fingers at each other and in the process break God’s heart into a million pieces. When we ponder how weird our climate is and when scientists in the most non newsworthy sector of science get all newsworthy and we start counting the tonnes of carbon we’ve pumped into the air since we discovered burning stuff was a prosperous way to drive an economy we run and hide too. We don’t come out and say, “boy, we’ve made a real mess of this gift we live in”. We hide. We deflect. Adam blames the woman. The woman blames the snake and God just stands in their midst wanting them to shut up while he thinks of how this can be put right again. We do the same. My guess is that Christians who deny that the climate is changing and that it is hard to exempt ourselves as one of the causes are enslaved to the lie that we can do whatever we want to the earth and God really doesn’t care. He is more concerned with who you are sleeping with, whether you take drugs or think women can be church leaders. I think, like Adam and Eve, they come to believe that the Garden is there for their own enjoyment and purposes. The fruit tastes good so they eat it. Nothing bad will come of it. 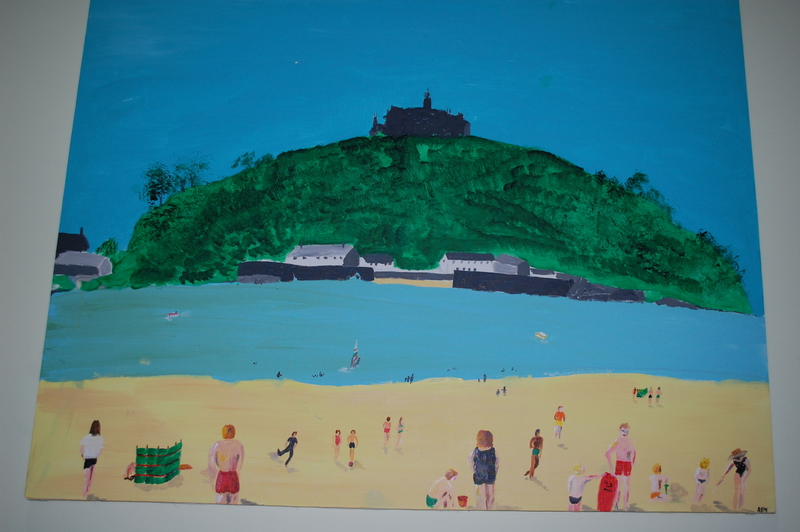 This painting was designed and painted by my wife and my middle son after a really good holiday in Cornwall. We are proud of the painting because of the personal investment. You can see us in the lower right hand corner. I am the pasty, tending to flab guy in the orange trunks. My wife is the svelte beach babe in the hat. Now, imagine that we loan this picture to our neighbours to care for it on our behalf and they do the following: they hang it on an outside wall, they don’t bring it in when it rains. They let the dog sleep on it. They use it as a litter box for the cat. When we go and visit our picture we are aghast: “What happened?!”. Clearly they have misunderstood what we meant by “take care of it” but as long as they stay true to their own style of stewardship, there is no problem. When I ask the simple question in assembly whether I should use this painting to shelter under when I run to my car in the rain, they all shout “NO!” One child warned me that my wife would kill me if I did. I ask them why? They tell me that it is such a personal creation and I should respect it and care for it like it is something special. Any person who uses the label “bible believing” need to take that on board when they read the very personal process of creation in the first chapters of Genesis. This special creation we live in is not ours to do with what we please. It is held in trust for God. It is held in trust for each other. It is held in trust for all the other members of creation be they plants or animals. What God gives, he gives in Trust rather than as freehold and no amount of denying will change that. This entry was posted in Uncategorized and tagged Adam and Eve, climate change on October 2, 2013 by newnortherner.